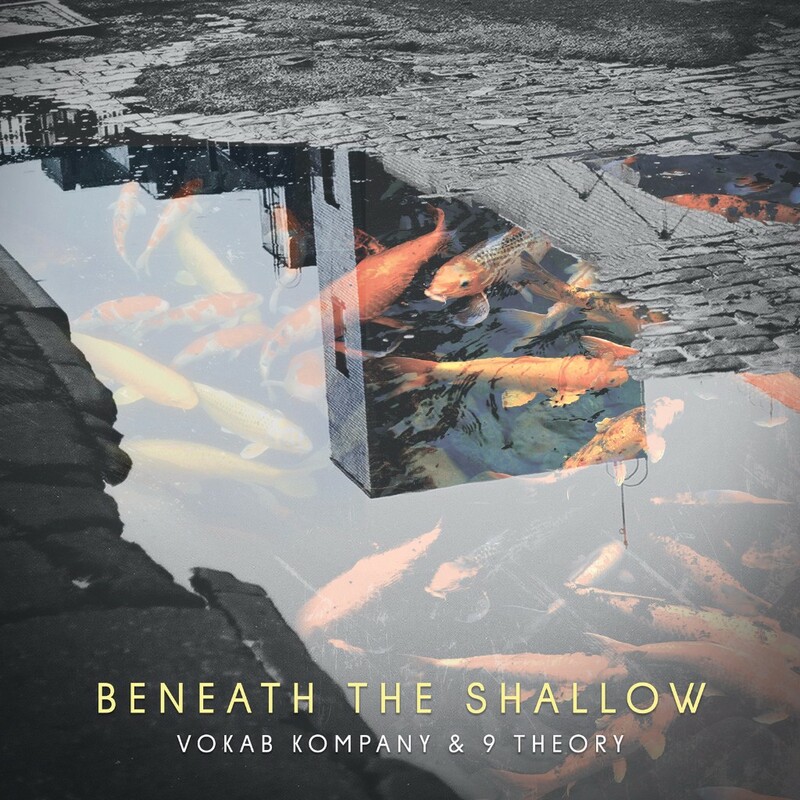 Vokab Kompany and 9 Theory recently released their two track EP titled Beneath The Shallow. Vokab Kompany is best known for bringing their high energy live-band electronic hip-hop with commercial pop sensibility sound to festivals such as Lightning in a Bottle and Coachella, and 9 Theory’s style could be described as indietronica with heavy flavors of golden-era hip-hop and indie rock vocals. Vokab Kompany delves deeper in their collaboration with 9 Theory discussing the painfully human topics of depression and addiction. High energy, synth driven hip-hop group Vokab Kompany and indietronica vocalist/producer 9 Theory bring us Beneath The Shallow. This collaborative two track EP sounds like the intersection of Radiohead and Outkast. While Vokab Kompany is often known for their intense live show and dance party flow, the subject matter here is much more intense and personal. “Beneath the Shallow“ is a direct response to the vibe and superficiality that can often permeate the mainstream festival circuit, particularly throughout the last decade and the rise of EDM. The EP tackles the intense and all too human issues of depression and drug abuse. Robbie Gallo of Vokab Kompany recently dealt with his brother’s addiction, motivating them to write the song “Warm In The Light”. They started a fund to support to generate support for The Delancy Street Foundation, which supports and rehabilitates patients. “Crack In The Sky” touches on depression, and is in memory of a close friend of Vokab‘s who tragically committed suicide. “Crack In The Sky” delves into the complex state of our minds, and the many voices in our minds, that can all too often drive people into the darker places of their psyche. Vokab Kompany and 9 Theory’s collaboration brings us a beautiful, raw, deep and touching two track EP. A 45″ vinyl record will be available for purchase soon at VokabKompany.com. Vokab Kompany is a six piece band, fronted by two MC/Vocalists, Rob Hurt and Burkey. They use heavy synths, guitars, bass and drums to create an innovative sound that ventures between bass music, jam band, and hip-hop. Vokab has released several studio albums to critical acclaim. Their unique mesh of styles has led them to delicious collaborations and over a dozen national syncs, including two Kia commercials, STARZ, Southern Comfort, MTV, Franklin and Bash, The Today Show, and the trailer for the recent Sacha Baron Cohen film The Brothers Grimsby. Vokab Kompany has played countless festivals including SnowGlobe, Electric Forest, Lightning in a Bottle and Coachella and have toured with bands of all genres including Umphrey’s McGee, Collie Buddz, and Del The Funky Homosapien. Vokab Kompany’s spontaneous live performance have allowed them to cross genres effortlessly; dancers, performance artists, guest musicians and unique arrangements continue to surprise fans, and exemplify the defining aspects of a Vokab Kompany show. 9 Theory is the solo project of eclectic producer, singer, songwriter, and recording and mixing engineer, Gabe Lehner, who has been passionately focused on creating music for nearly twenty years. Lehner’s notable past projects include indietronica band Inspired Flight and indie rock duo Metrofique. With a love for learning guitar and writing songs that slowly evolved into an obsession with producing, recording, and making beats, Lehner has come into his own as a renowned producer with a knack for effectively blending different genres of electronic, indie rock, and hip-hop into an original, unique sound. Lehner has also become an impressive remix artist. His notable past performances include Coachella, Lightning In A Bottle, Camp Bisco, and Electric Forest. Lehner has also opened for major artists such as Thievery Corporation, Bonobo, STS9, Beats Antique, and Emancipator. The culmination of Lehner’s twenty year journey has led to the birth of his first solo project, 9 Theory, which combines many different genres into a beat-heavy electronic sound with indie rock and hip hop undertones. 9 Theory’s debut album Against The Odds Of Entropy featured collaborations from MCs Killer Mike of Run The Jewels, Killah Priest of Wu-Tang, Eligh and Scarub of Living Legends, and Sophie Barker of Zero 7.